50% Off Wallets On Handbag Orders at Cath Kidston Buy any handbag at Cath Kidston and get a wallet of your choice half price, shop now for this amazing deal! Any Wallet Half Price on Heywood Shoulder Bag Orders at Cath Kidston Buy a Heywood shoulder bag at Cath Kidston and get any wallet half price! New In Fearne Collection at Cath Kidston-Must Have! Shop the creative new Fearne Cotton x Cath Kidston collection now! 50% Off Selected Styles at Cath Kidston - New Sale Lines Just Added! Check out the spring sale at Cath Kidston with up to 50% off your favourite products and styles. £25 Off Selected Bags at Cath Kidston-End of Season Sale Beautiful floral, patchwork and spring bird printed bags all in the Cath Kidston end of season sale. Don't miss out on fantastic savings up to £25 off today! 50% Off Selected Disney x Cath Kidston Collection at Cath Kidston Get up to 50% off the beautiful Disney x Cath Kidston range at Cath Kidston including Bambi and Mickey Mouse! New In SLYDES x Cath Kidston Collection at Cath Kidston Keep your feet cool this summer and shop the Cath Kidston SLYDES range. New In Bags from £16 at Cath Kidston Brand new prints for the spring have landed at Cath Kidston, Shop the gorgeous range of bags from only £16! Free Delivery on Orders Over £40 at Cath Kidston Get your Cath Kidston order delivered for free when you spend £40. Cath Kidston is a unique fashion and homeware brand that was founded in London in the early '90s. It has since become a phenomenon, with legions of fans in love with the cute, quirky designs. From polka dots to florals, Cath Kidston prints have an undeniably vintage feel to them and have been applied to both traditional and modern products - from aprons and dresses through to covers for tablets and laptop friendly bags - to create charming and stylish products for all to enjoy. Shop by Collection and enjoy the best season picks, browse bags for backpacks, totes, handbags and more or take a look at the accessories and fashion goods on offer. At Cath Kidston you can embrace your style and personality with what you wear and in your surroundings too. With a plentiful Home section, find bone china mugs, bedding, fabrics and more - you can invigorate your interior design in an instant with this colourful and quintessentially British brand. If you are a fan of the cheerful, instantly recognisable designs that Cath Kidston is known for, why not spread the love? If you want to gift someone but can't decide what to choose, you can give them a Cath Kidston gift voucher to let them decide. Perhaps you have found the perfect gift, in which case you can choose the gift-boxing service when you order, so that your order gets shipped in pretty tissue paper and a signature Cath Kidston presentation box. Whether you are treating yourself or buying a gift for another - Cath Kidston is full of elegant and beautiful goods that everyone is sure to adore. How do I use my Cath Kidston promotion code? Deals which don't require a code will be automatically applied so you can continue with your transaction securely. Visit the Offers' page at Cath Kidston to find discounted goods, out of sale season! Does Cath Kidston offer student discount? Students can get 10% off their Cath Kidston orders online with a valid UNiDAYS account. Where is my nearest Cath Kidston shop? Use the store finder facility on their website, which lists all branches worldwide, to find one near you. What size should I buy in Cath Kidston fashion and footwear? If you are unsure about what size to order for footwear, clothing or products for kids, you can check on the Cath Kidston size guide here. Cath Kidston has a 28-day returns policy, find further information here. Tel: 0333 320 2663 between 9.00am - 8.00pm, Monday to Friday and Saturday/Sunday between 10am - 4pm. 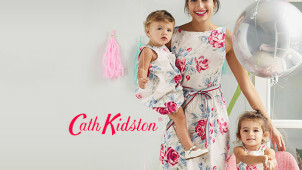 Cath Kidston is a cool UK brand for women and kids, that features clothing, accessories, and homeware in stylish retro inspired prints and designs. With a wide range of bags, accessories and much more on offer, you can get great value on your summer pickings when you shop using a Cath Kidston discount code from vouchercloud. For baby clothes, soft furnishings, luggage, dresses and plenty more - all in that signature Cath Kidston unique and quirky style - look no further! The Cath Kidston brand actually first started as a retailer of vintage finds, rather than Kidston's own designs. Cath Kidston originally stocked her west London shop with things she found at car boot sales and by trawling vintage stores, but soon decided that the direction she wanted to go in was using the cool styles of these vintage pieces to create her own designs and products. See more online with Cath Kidston voucher codes and why not visit the blog for some original and quirky inspiration too? Why not check out the baby range at Cath Kidston for your own kids or to find a gift for a friend with a new addition on the way this summer? Shop with a Cath Kidston voucher code to save on adorable clothing for baby boys and girls. With charming baby changing bags, in new season and original prints including daisies and buttercups and meadowfield birds - you'll find toys, bibs and more on offer. Cath Kidston really has the perfect assortment of goods for when it comes to looking after the little ones.